The following (edited) devotional was originally written in 2013 and re-released just yesterday on ProverbialThought.com. Amazing how little things have changed. Some things make perfect sense. Some things are so sensible that everyone agrees, hence the term “common sense.” However, there are some things that people find hard to understand, even though anyone with common sense would think it makes perfect sense. The following proverb should be a no-brainer. Are you familiar with the Ten Commandments? Not the movie with Charleton Heston; I’m talking about the actual Ten Commandments found in the Bible. If you haven’t read them in a while, why don’t we refresh ourselves with a few of them? If you want to live in such a way (ethically speaking) that will please the Lord, the above list is a good place to start, wouldn’t you think? What is more pleasing than not stealing, not murdering, not lying, not envying, etc.? Believe it or not, doing what pleases the Lord (like not committing murder, not stealing from your employer, or not sleeping with your boss’s wife) is actually a good way to get ahead in the world. Common sense, wouldn’t you think? I have worked with many atheists and agnostics, some of which hated what I believed, but none of them ever fired me for being a bad employee. Most gave high recommendations to my next employer. In one sense they were my “enemies,” but all in all they were peaceful. Why? Because my ways pleased the Lord. So, what were they saying, that if the Ten Commandments were left up someone might actually be tempted not to steal, not to lie, etc.? Here’s a question… Which is more pleasing, a) NOT committing murder, or b) gunning down students and teachers? I guess there’s a shortage of common sense these days. The following is derived from a post I wrote for my other blog, Proverbial Thought. It can also be found in Proverbial Thought: Your Daily Word of Wisdom from Proverbs (Parson’s Porch, 2014). Do you like to tell dirty jokes? Then there must be lust in your heart. Do you always talk hateful? Then there is hatred (and maybe murder – see Matthew 5:21-22) in your heart. Do you ever talk about God? About Jesus? About your love for Him? If not, maybe He’s not in there. This is just an informal note to all my readers that nothing formal is going to be published on this blog until I finish my research papers that are due by the 11th of this month (taking a deeeeep breath). Sooooo…since you will be being (I love that, “be being”) deprived of in-depth analysis of most things irrelevant, why not take a look at another blog to which I contribute (or, “which I contribute to,” if you prefer ending with a preposition). 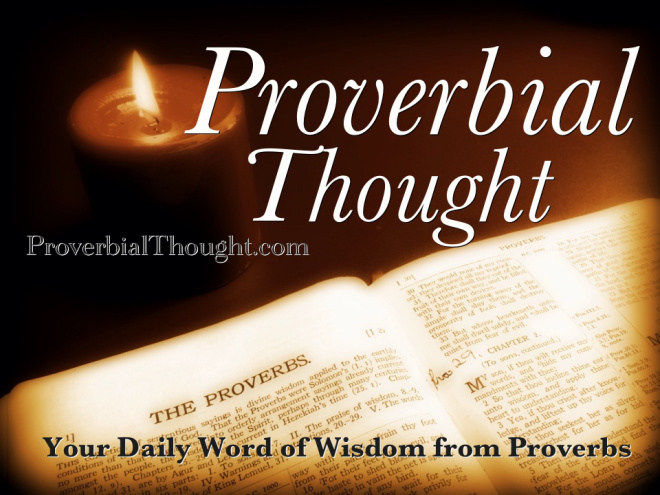 Proverbial Thought is a daily devotional/commentary on the book of Proverbs. Several other writers, along with myself, daily take a proverb (not just a verse, even though most proverbs are only one verse) and share our thoughts. It’s more than a typical commentary…it’s a testimony to real-life examples of how biblical wisdom is expressed. In the meantime, be thinking of me. I’ve got eight days to do what should have been done weeks ago.